Medlock Ames just doesn’t disappoint. This 2002 Cabernet Sauvigon is extremely well balanced. The robust structure never overwhelms the dark delicious blackberry and blueberry fruit. And the forest floor earthiness is reined in but present. 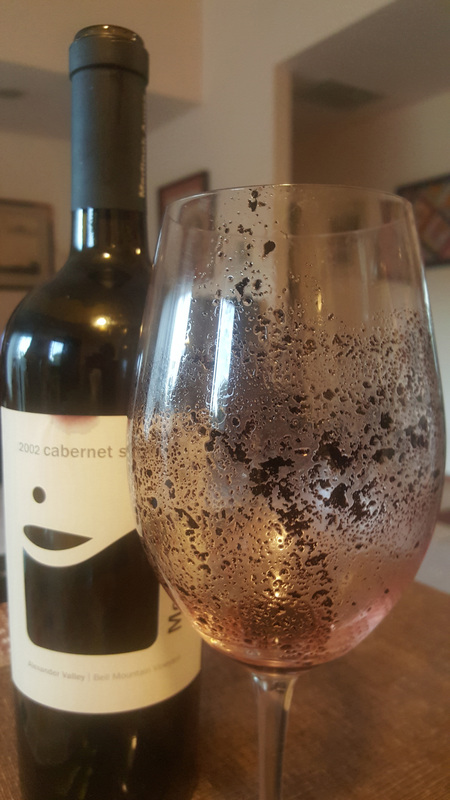 We were delighted to see the sediment on this unfiltered wine. At the beginning of March, I went to Bell Mountain Ranch and met with Ames Morison. He is thoughtful, focused and intense and was so very generous, giving a wonderful interview about his winemaking philosophy, his passion for sustainable and organic farming practices and making exceptional wines. Medlock-Ames won the best of class for their Kate’s and B’s 2011 Cabernet Sauvignon at the San Francisco Chronicle Wine Competition of 2015, a competition that features over 6,400 wines. The interview starts in the middle (sorry) and was slightly truncated due to some wind in the microphone, but we did get in on Ames discussing Malbec which he believes adds a great deal to all of his blends. The fantastic Medlock-Ames winery is producing some of the best wines, from grapes that are sustainably grown on the lovingly cared for Bell Ranch in Alexander Valley, California. 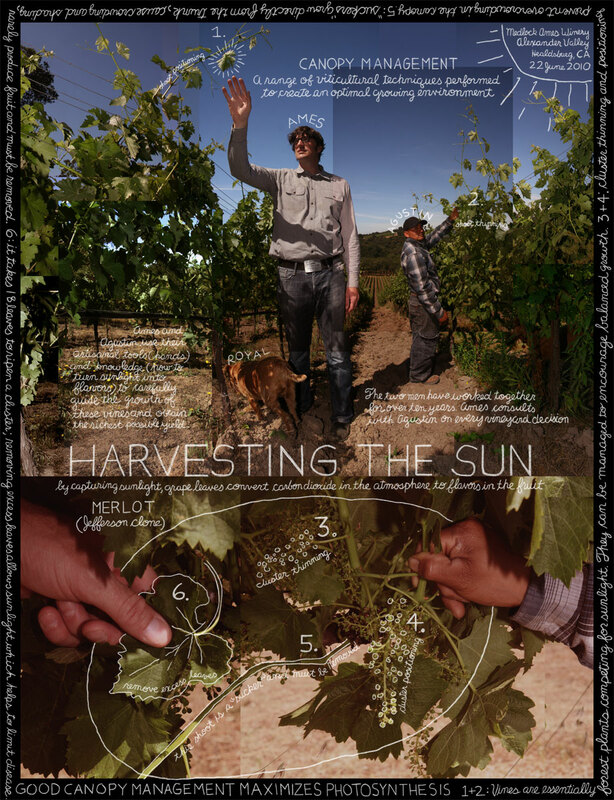 Their vineyards are farmed organically with no insecticides, chemical fertilizers or herbicides and solar power provides the energy they need to run. Only 55 out of 338 acres are farmed, the majority of land has been left in a natural state – reserving the majority of the acreage for oaks and wildflowers, not vines. Innovative and traditional methods are used to farm this boutique vineyard where vegetables, olives and wildlife also flourish. The portfolio includes Chardonnay, Sauvignon Blanc, Reserve Chardonnay, Merlot, Pinot Noir, Cabernet Sauvignon, a Red Bordeaux Blend, estate bottled olive oil, verjus and preserves. Last week we had the good fortune to get a tour, with our guide being the fabulous Stacy Sheridan, and taste some of the wines. We met Ames and are grateful that he graciously agreed to answer a few questions. Keep on the look out for an in person audio interview with Ames, where we get in deeper and taste some new releases. How did you come about becoming a winemaker, and what and who influenced you? 19 years ago I was living in New York City, and I remember very vividly drinking a glass of wine (Talbott Diamond T Chardonnay, which is from your neck of the woods), when I had an epiphany. I was suddenly fascinated, obsessed with the magic that allowed dirt, sunlight and water to create something so ethereal in the glass, and from that moment, I knew I had to become a winemaker. Within two months I had quit my job and moved to California to follow my dream. I’ve had so many influences. My father is a farmer and tends a farm that has been in our family for 8 generations. That really taught me what it means to care for land so that it cares for your family indefinitely. I was a Peace Corps volunteer in Guatemala working with people who have been farming the same land for 10,000 years. That is the definition of sustainability. I have had some incredible professors at UC Davis, Andy Walker in particular. I really admire winemakers who have been so passionate about their beliefs that they have risked everything with single-minded purpose. Josh Jensen of Calera comes to mind. What styles are you particularly interested in exploring? We farm organically and I feel that is the best way to care for the land. I have a minimalist intervention approach to winemaking as well, but I am fascinated with natural wines. The term is not really defined, and many have their own interpretation, but in general that means not adding anything. I have tried some of these wines and find them so completely different from everyday wine. Many make fun of these “orange wines” and they sometimes feel like the latest trend in winemaking. Sommeliers and “cool” winemakers love them as they are not ordinary. Their commercial success is dubious, but I still want to my hand at making them! How challenging is it to stay organic and sustainable? For me, it’s a bedrock principle, so it’s not hard. There are plenty of decisions that I fret over because I don’t know what the right direction is, but farming without chemicals, farming in a way that works with nature rather than against it is so ingrained in me that I don’t really think about it that much. 2010 & 2011 were very challenging vintages as they were so cold and wet. Disease pressure was dramatically higher than normal. If there was ever a time to make a grower question organics it would have been those years, but as an organic grower, we are always worried about disease pressure, so we are constantly monitoring for it. We fared better than most conventional growers that year. What new wines are you looking forward to making? A few years ago we planted a tiny amount (less than half an acre) of Malbec. From its first harvest it quickly became the darling of the winery. We use it to blend with several of our other wines and it just makes everything better. We were so pleased with what this variety does on our vineyard that last year we budded over another acre to Malbec, and in a few years we may bottle a varietal Malbec. I would love to show what this variety is capable of in the Alexander Valley. 2013 Sauvignon Blanc This is a delicious and mouthwatering wine. The bright, citrus aromas of ripe grapefruit and Meyer lemon are complemented by tropical notes of pineapple, guava, and a hint of wood. The juicy acidity provides a crisp, fresh finish. 2012 Lower Slope Chardonnay Luscious. Bright, tropical fruit on the nose with hints of apricot, lemon custard and sweet cream. An elegant lush Chardonnay with rich, toasty oak balanced by firm acidity and hints of slate and minerality. 2010 Kate and Bs Cabernet Sauvignon Has a great nose with blueberry, spicy toasted caramel, ripe plums, and gunsmoke aromas leading to toasted brown sugar, dark chocolate fudge, dried spices, and bacon flavors. The touch of Malbec adds blackberry and plushness. There is good acidity and a firm backbone. 2011 Fifty Tons Cabernet Sauvignon Aromatic nose, a floral note of lavender, camphor, and rosemary. A profound and dark wine, the Fifty Tons Cabernet Sauvignon is black fruit focused with additional flavors of roasted coffee, black currents and toasted hazelnuts. The long finish is supported by a significant expression of oak including a hint of smoky chocolate and burnt sugar. The tannins are grippy and there is much depth with this wine, will age well.